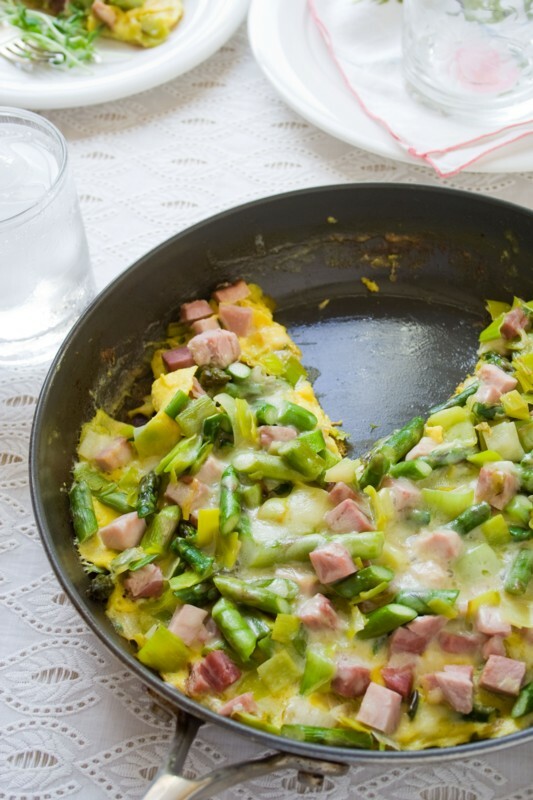 This Frittata with Ham and Asparagus is the perfect Spring meal! Ready in just 20 minutes, chocked full of 23 grams of protein, naturally gluten-free, primal and super kid friendly. AND you can eat it for breakfast, lunch or dinner. See, like I said… perfection! 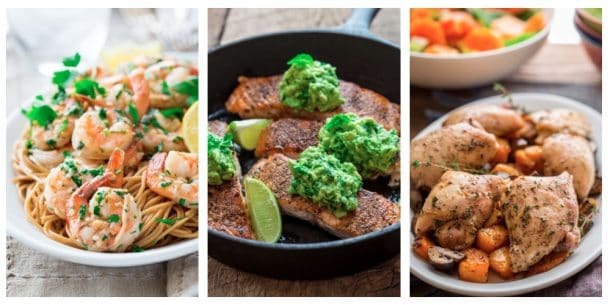 I originally shared this recipe on April 5, 2012. I have updated the images and some of the text today. If it were up to my kids, they would eat granola bars, yogurt and fruit for 100% of their daily calories. Don’t get me wrong, they are great eaters. Neither is particularly picky, knock on wood. They just like their sweets and their easy carbs. So I feel like I have to strategize every day to make sure they are also getting vegetables, calcium, healthy fats and protein. More specifically, I try to make sure I give them some sort of protein at every meal. That’s why I am so grateful for the carton of organic local eggs we get in our CSA most weeks. If I make eggs for my kid’s for breakfast,I know we’re off on the right foot in the morning. If we have cereal or toast for breakfast instead, I know it’s an option to include eggs elsewhere in our daily menu. Like hard-boiled in a lunchbox, or a frittata for dinner. For myself, I love the fact that a whole egg is only 70 calories. And a white (which is pure protein) is only 15 calories, so I eat them for breakfast several days a week. 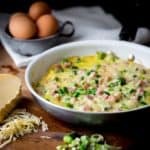 Here is a frittata recipe with ham and asparagus based on this technique I used in my zucchini and chive frittata. I whipped it up with springy ingredients for Melissa Pasanen’s article in the Burlington Free Press. My family happily gobbled it up for dinner, and I loved the left-overs for breakfast. Today, this recipe is part of the monthly Eat Seasonal group I am participating in. Here is a list of the other recipes in the line-up. This frittata recipe is my contribution. 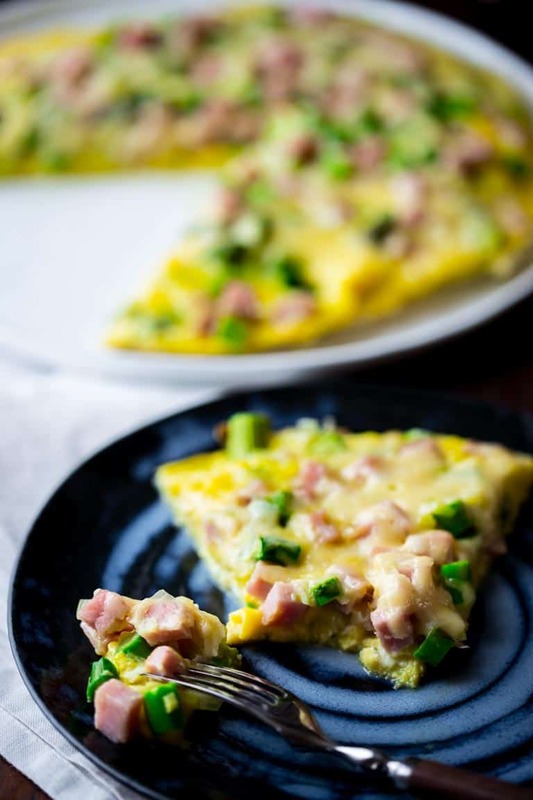 This Frittata with Ham and Asparagus is the perfect Spring meal! Ready in just 20 minutes, only 297 calories per serving, chocked full of 23 grams of protein and super kid friendly. AND you can eat it for breakfast, lunch or dinner. See, like I said… perfection! Heat 2 teaspoons oil in a large non-stick skillet over medium-high heat. Add leek, asparagus and salt and cook, stirring occasionally until bright green and just starting to brown, 5 to 7 minutes. Transfer the vegetable mixture to a bowl and stir in ham. Was and dry skillet. Beat the eggs in a medium bowl with the pepper and nutmeg. Return the skillet to medium-low heat and add the remaining 2 teaspoons oil and swirl the pan to coat with oil. Gently pour in the eggs and let cook, gently scraping the egg with a silicone spatula. Fold the cooked part of the egg back and allow runny egg to flow onto the surface of the hot skillet just until the egg starts to set up into a solid mass, 2 to 3 minutes. [The egg will still be runny on top, but continuing to stir would cause it to break into pieces at this point.] 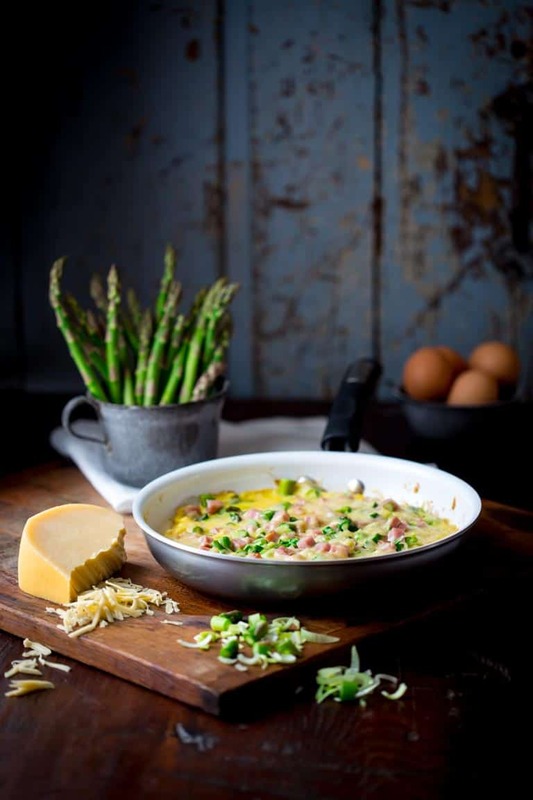 Spread the asparagus mixture over the eggs and continue cooking until the sides of the egg can be pulled back from the skillet with the spatula, 1 to 2 minutes. 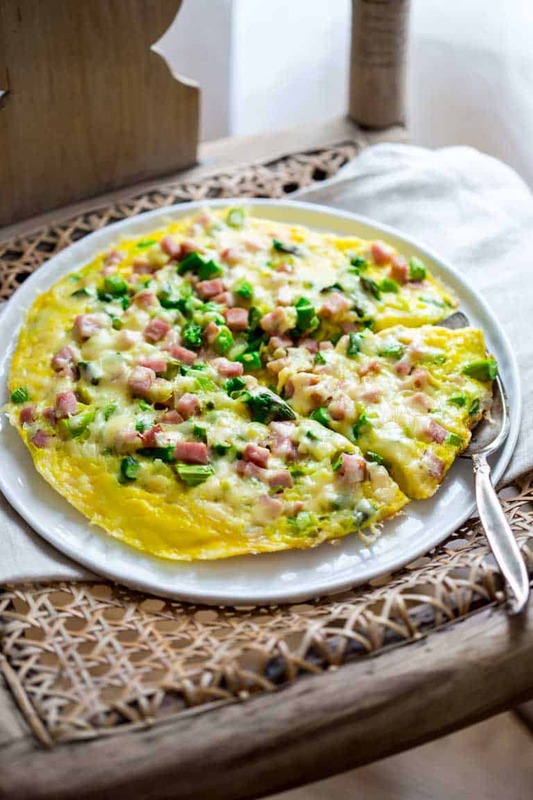 Sprinkle cheese over the frittata. 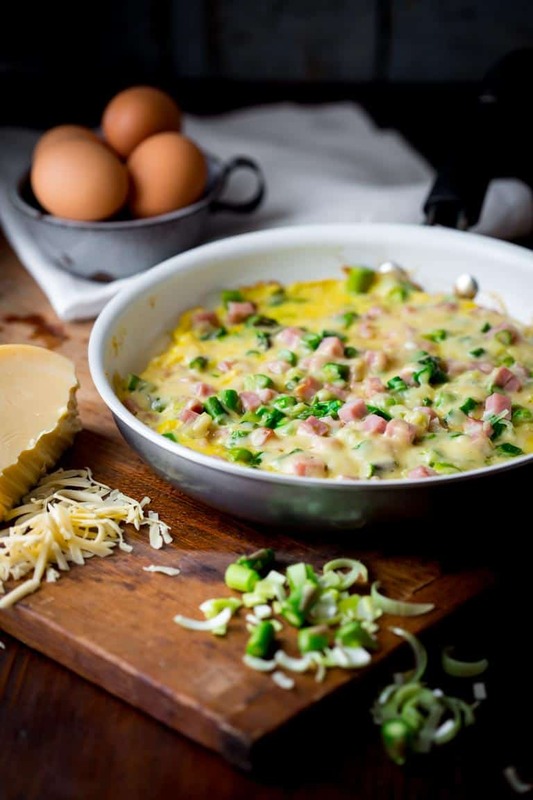 Lift an edge of the egg back and drizzle 2 tablespoons water between the egg and skillet, cover the skillet and cook until the egg is set up on top and the cheese is melted, 4 to 5 minutes. Tip* To Clean a Leek: Cut off dark outer greens leaving just the white and light green part. Slice lengthwise, and then slice into strips crosswise. Tansfer to a bowl of cold water and swish around to get all the dirt out from between the layers. The dirt will fall to the bottom of the bowl. Lift the clean leek out leaving the sand at the bottom of the bowl. Lay out on a towel to dry. Oh I’m like your kids – I could definitely just eat yogurt, granola, fruit, etc. all day long. It’s a struggle for me with protein as well. 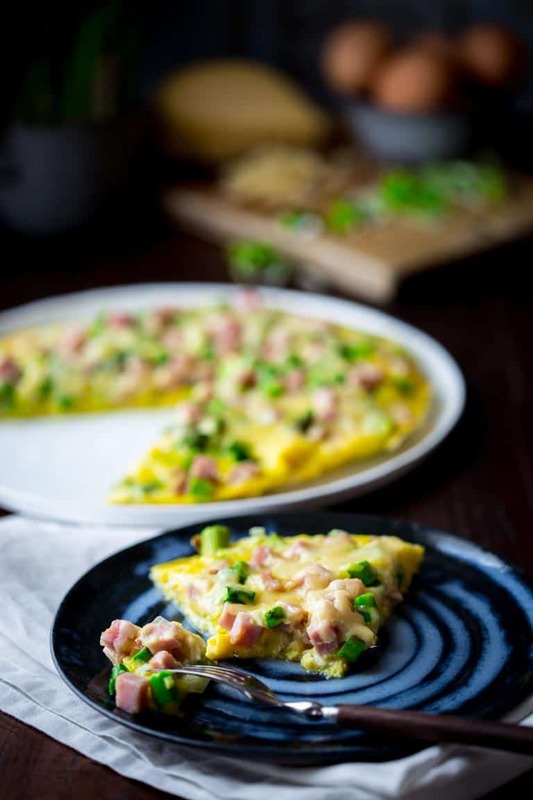 I definitely need to try this frittata! Looks so fresh (and easy!). And just gimme all the asparagus RN! Pinned! And I have all these ingredients. Yay. Can’t wait to try this one. 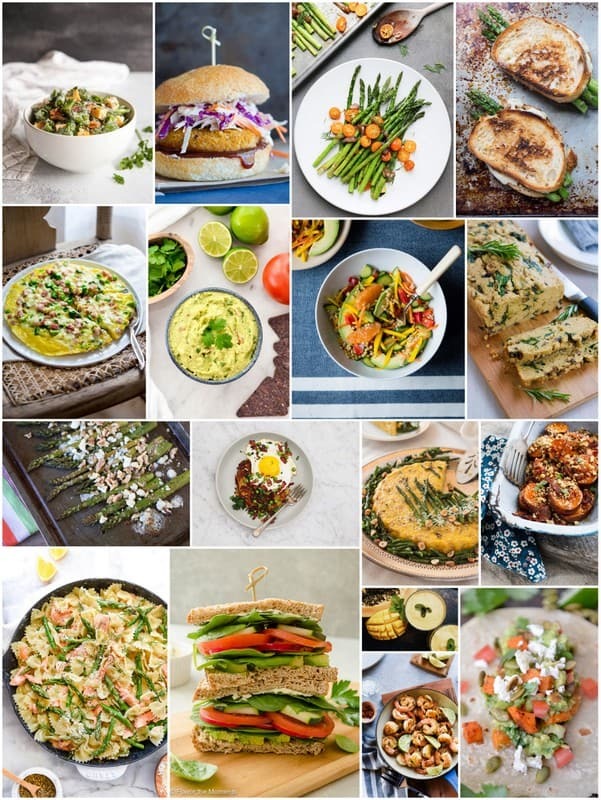 Fritattas are one of my favorite easy meals! Love this version! You are making me miss our CSA! It hasn’t quite started up for the spring / summer. 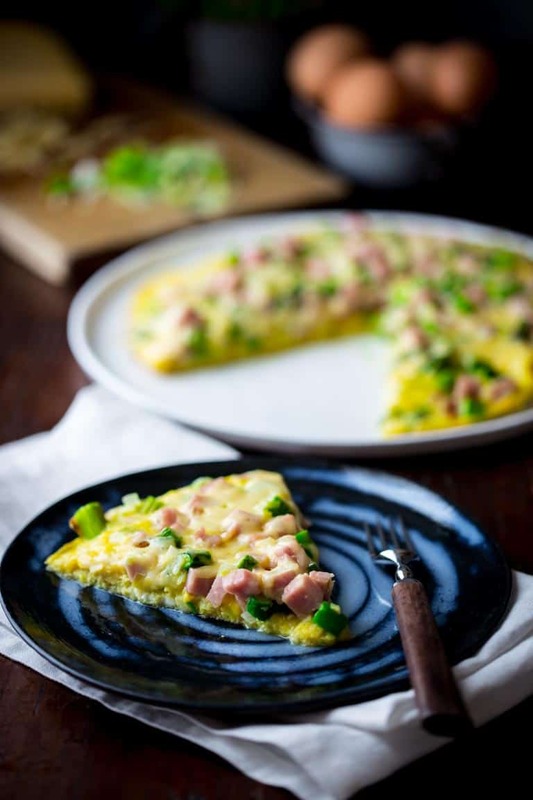 I LOVE a frittata for a quick and easy dinner. And spring flavors a just perfect for them. I love this it sounds so delicious! So fresh and a great way to get your vitamins. And I love asparagus. 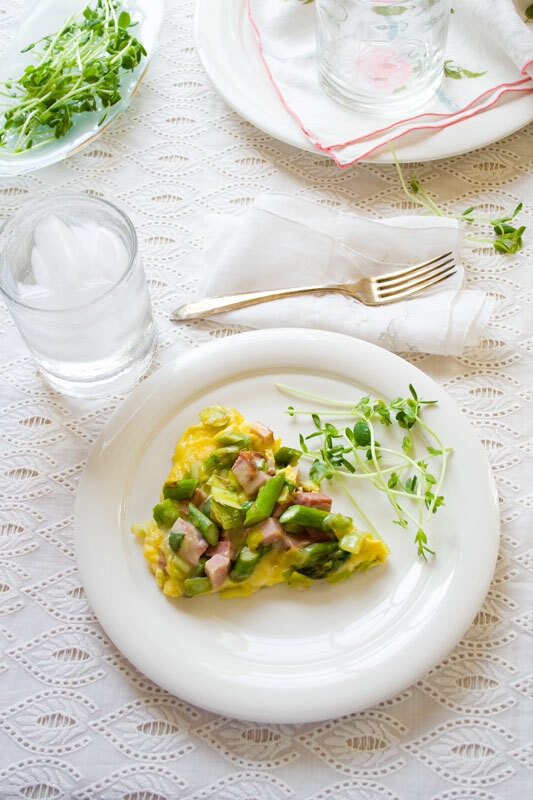 Your frittata is beautiful and perfectly spring-y! We too serve up eggs for at least one meal a day! I’ve started buying them in bulk! 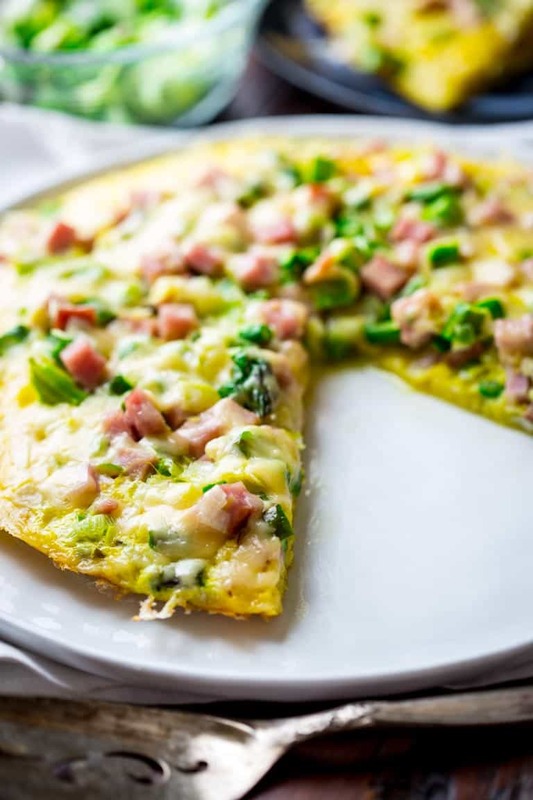 I’m sitting here right now trying to figure out what to make for breakfast and really wishing I had this delicious frittata in my oven right now! 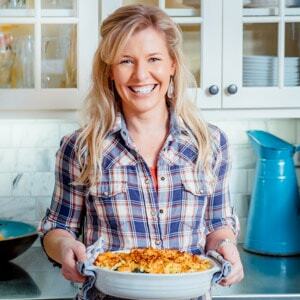 I love a 20 minute meal that is loaded with eggs and cheese and asapragus!